More than 10,000 people attended a Peace People rally in Trafalgar Square. 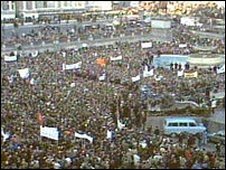 At times during the Troubles it seemed that every bombing or shooting was followed by a rally or vigil. Communities came onto the street to express their anger and disgust. The trend was born in 1976 with the death of three young children in Belfast. Described in a BBC report as "part traffic accident, part terrorist incident", an out-of-control car ploughed into Anne Maguire and her children. The driver, IRA man Danny Lennon, had been shot dead by a British army patrol which was chasing him. Six-week-old Andrew, two-year-old John and eight-year-old Joanne died. Their mother, Anne, was maimed physically and mentally - and would take her own life some years later. Anne's sister, Mairead Corrigan, made a grief-stricken appeal on television for peace. Her impassioned appeal struck a chord with a community traumatised by the Troubles. Within three days of the awful tragedy, the Peace People was born. They marched in cities and towns such as Belfast, Enniskillen and Ballymena and held one of their most high profile rallies in Trafalgar Square in London. More than 10,000 people demonstrated for peace, while legendary folk singer, and political activist Joan Baez serenaded the crowd with the anthem: "We Shall Overcome." When the women marched on the Falls Road in Belfast, they came under attack from stone-throwing republican youths. In October 1993, thousands of Protestants and Catholics stood side-by-side as a small rural community buried the victims of Greysteel. Eight men had been gunned down in a local pub by a loyalist UFF gang in the County Londonderry village. The attack was carried out in retaliation against an IRA bombing of a fish shop on Belfast's Shankill Road which killed nine people. In February 1996, the 17-month-old IRA ceasefire ended with a bombing of the Docklands area of London. A bomb, weighing half a tonne, exploded on 10 February, killing two men and injuring 39 others. Over the next few days, tens of thousands of people took to the streets in Belfast, Armagh and Enniskillen and in Dublin, Limerick and Galway to voice their dismay at the collapse of the ceasefire. Many rallies had political, as well as peaceful, overtures. The Ulster Hall has, throughout the decades, hosted loyalist and nationalist rallies. On 14 May 1998 a newly paroled Michael Stone appeared at a event organised by the Ulster Democratic Party to campaign for a 'yes' vote in the upcoming referendum on the Good Friday Agreement. Ten years earlier Stone had attacked a funeral at Milltown Cemetery in west Belfast, killing three people and injuring more that 60. 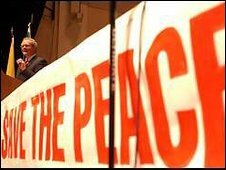 In October 2002, Martin McGuinness addressed republicans in the hall urging then to stick with the peace process. On 4 October the Sinn Féin offices at Stormont had been raided by police as part of a police investigation into intelligence gathering by republicans. Ten days later the Assembly was suspended. Bill Clinton attended many rallies for peace in Northern Ireland during his tenure as President of the United States. In 1995 he switched on the Christmas lights in Belfast, celebrating a ceasefire that was to collapse within months. In September 1998 he was back in Northern Ireland to address a crowd of around 10,000 people in Armagh. It was in the wake of the Omagh bombing, where 29 people died in a Real IRA bombing, and President Clinton made an emotional speech at the gathering. 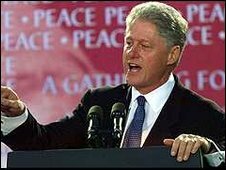 "We saw children scarred because of the madness that if someone could just set off a big enough bomb and kill enough Protestants and Catholics, men and women, enough women and children, enough people from Northern Ireland, Ireland and foreign countries then maybe everyone would walk away from peace," said president Clinton. "But it backfired. Out of the unimaginably horrible agony of Omagh the people said it is high time that somebody told these people that we are through with hate, through with war, through with destruction and it will not work any more." When Catholic postman Daniel McColgan was killed by loyalist terrorists on his way to work in January 2002 the people of Northern Ireland gathered once more. More than 50,000 were estimated to have filled the streets around Belfast's City Hall. Rallies were also held in Belfast, Londonderry, Omagh, Enniskillen, Newry, Cookstown and Strabane. The killings of Constable Stephen Carroll and sappers Mark Quinsey and Patrick Azimkar this week have people spilling onto the streets once more. On Wednesday silent protests were held in Belfast, Lisburn, Newry, Downpatrick and Londonderry. A peace vigil was held in Craigavon, County Armagh, near the site where Constable Carroll was shot dead.